Synthesized non-phosphopeptide derived from human FGFR1 around the phosphorylation site of tyrosine 766 (Q-E-YP-L-D). ab63601 was affinity-purified from rabbit antiserum by affinity-chromatography using epitope-specific immunogen. Our Abpromise guarantee covers the use of ab63601 in the following tested applications. 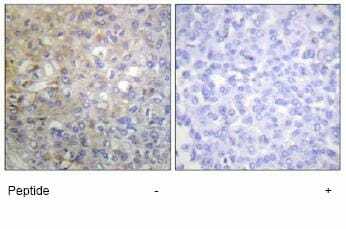 ab63601, at 1/50 dilution, staining FGFR1 in human breast carcinoma by Immunohistochemistry on paraffin-embedded tissue, in the absence (left image) or presence (right image) of immunising peptide. Publishing research using ab63601? Please let us know so that we can cite the reference in this datasheet.